Passage North: The annual northern traverse of rare flying beings, whooping cranes, is a cause of celebration and hope. 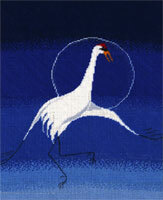 Moonlight Dancer: The courtship dance of the whooping crane is an expressive and urgent outburst of flurried motion and grace from one of the world's rarest spirits. It's Your Move is a delightful work of three deer, in silhouette, at dusk. The work beautifully captures these graceful creatures in an often-sighted pose. Crescendo is a captivating image of wolves howling in the night. 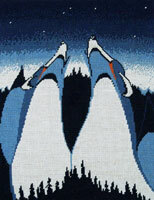 Ascendant Orcas is a West Coast influenced work depicting three playful young orcas. 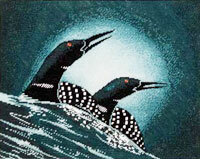 They Claimed the Night is an arresting image of two loons, riding the crest of the waves at dusk. The Conversation: We are capable but have not perfected the ability to communicate through thought, thus the spoken word. My favourite conversations are with my close female friends. Through conversation we are able to communicate many emotions. Sisters: There is a spiritual connection between siblings that surpasses all else. The passage of time does nothing to disturb the intensity of the love and loyalty. There exists a freedom to confide in one another about anything. 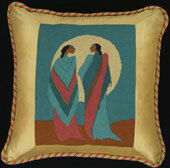 There is a comfort, an innate knowledge that we have traveled the same path to earth. 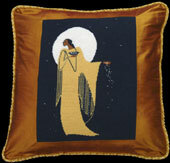 Mother Night: She begins by dropping the first bright, brilliant evening star, then sprinkles them across the clear night sky, creating great beauty. We are guided across great distances by her intricate designs. 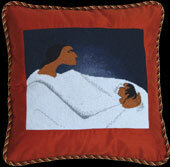 Mother and Child: The love that exists between a mother and child goes beyond comprehension. I feel a new spirit, soul, child, chooses those through whom they will come to be earth bound. 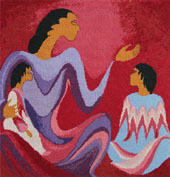 Henceforth that intense love and connection between them...between a mother and child. 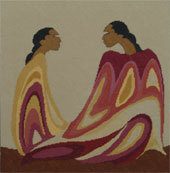 Ancestral Teachings: The teachings of our ancestors are timeless. They follow the natural order of things. Should we stray from the path, we need direction. In order to accomplish this, we need the old teachings….the teachings we can get only from our elders.